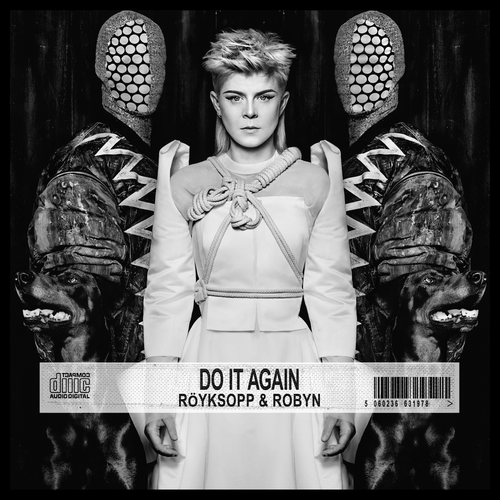 After Röyksopp and Robyn announced that they'd be touring together and recording new material, I could imagine hordes of fans of quality pop music went absolutely bonkers. I for one did. The duo had collaborated twice before, with amazing results: both "The Girl and the Robot" and "None of Dem" were brilliant slices of glacial, bewitching Scandinavian pop. Expectations were building up. Only to be further stirred by the lead single (and title track of the EP) "Do It Again" that premiered two months ago. It's every bit as anthemic as you'd expect from a collaboration between these two, with a simple but driving beat and accessible sing-along lyrics. And the bridge amps up the song on yet another level. While an infectious dance floor filler, there's actually some definite darkness to it - the lyrics describe an unhealthy relationship which the storyteller finds herself unable to resist and is helplessly drawn to, like a moth to a flame: "Don't care what they say, it hurts so good / I don't wanna stop, I know I should / But let's do it again, one more time". But interestingly enough, that's as close as the trio gets to danceable bangers, with the rest of the EP being much more experimental and ambient material. The fateful-sounding opener "Monument" is a prime example of this: clocking at nearly ten minutes, this gloomy number is awash with impromptu saxophone solos and synths sweeping over the listener like ocean waves. Along with "Do It Again", "Monument" is the most memorable song on the record, although its excessive length (which on the other hand can be seen as a sign of uncompromisingness) kind of turns against itself, as the last three minutes or so don't really bring anything new into the mix. Still, it serves as a gorgeous ethereal intro for the 35-and-a-half minute journey. And then things get weird with the glitchy "Sayit" that sounds like an aural equivalent of the nightmares a crystal meth addict would have. I haven't got the vaguest idea of what this eerie, pulsating stomper is about. It sounds a bit as if Robyn was teaching a robot (actually an old Speak & Spell toy computer) to speak, and then in the end it orders Robyn to be quiet. Is it about artificial intelligence? A robot uprising scenario? A one-sided love relationship à la "The Girl and the Robot" where a woman tries to urge her lover to reciprocate her love, only getting a robot-like mechanic reply in return with no true emotion? Your guess is as good as mine. Do It Again is likely to take its listeners by surprise, as many were probably expecting the three to emerge with radio-friendly material in the style of their previous collaborative pop gems. However, they opted for a more unorthodox and progressive sound, which makes the EP an unpredictable listen. Rather than reeling the listeners in with contagious melodic and lyrical hooks (well, with the exception of the title track, of course), Röyksopp & Robyn drench their collaborative material with emotions and ambience, painting chilly landscapes with layers and layers of synths. In that sense, Do It Again is a very courageous move, especially from Robyn's part, considering she basically established her current status as a Scandinavian pop deity with the irresistible earworms and dancey electropop songs of her 2010 Body Talk trilogy. As such, it won't cater for everyone's needs, and it doesn't quite compare to the previous fruits of their labour - "The Girl and the Robot" especially was a masterpiece. Don't let that blur your judgement, though: concentrate on the eccentricity and the adventurousness of the sound, and you'll discover what a fascinating record it actually is. Try at least: "Do It Again", "Monument"